Our rescue dog Nellie being adored by refugee children who have just arrived on Lesvos, by rubber boat. Nellie is such a sweet girl and so gentle and the children are immediately drawn to her. Last week I returned to Sydney. It took around thirty-three hours’ door to door. I travelled from My Greek Island Home by car to the airport and then took three planes before being chauffeured to my final destination, my apartment in Potts Point. I was fed along the way, watched a couple of movies and slept comfortably. On arrival I was greeted by my Mum, Dad and my best friend friend Mary Lou. My apartment was clean and warm and there was a scented candle burning and white roses had been placed beside my bed. We drank wine, nibbled on some delicious, cheeses and chattered. I felt safe and loved. So why am I telling you this? Because I have been trying to process a situation that has been unfolding daily, an enormous human crisis. 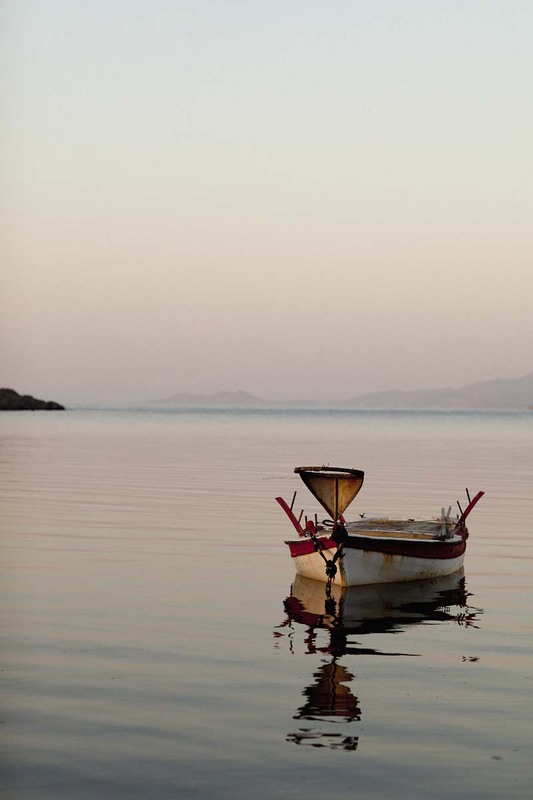 My journey began on The Greek Island of Lesvos, the third largest of the Greek Islands. My partner, artist, Matthew Usmar Lauder and I have had a house there for the last ten years. Lesvos is a beautiful island situated in the Northern Aegean and up until recently an island that most people had never heard of. Now not a day goes by without it being mentioned on the news as thousands of refugees flee their homes, from countries where they are longer safe. They risk their lives travelling across the Aegean in over crowded and unsafe rubber and wooden boats in the hope of finding a safe place in Europe for themselves and their families. On a late spring morning two years ago Matthew and I were walking our rescue dogs along the dirt track which winds out of our village for five kilometres to the Aegean Sea. It was a beautiful day and we were enjoying our walk in the sunshine. The sky was clear and we could see Turkey. On this particular day we saw something unfamiliar, a group of people in the distance, usually we only see a few of the local farmers. At first I thought it was an organised group of walkers but on closer inspection we realized they were refugees. We were shocked, really shocked. There were about thirty of them and the group included woman and children. It was so out of the blue and so out of context. We stopped and spoke with them, a couple of the males spoke English. They were Kurds and Somalian and they did not no where they were, let alone that they were on an island. They wanted to get to the nearest police station. This was our first encounter with refugees and we had no idea at that time of the avalanche that was to come. Every day is a challenge, a struggle an emotional roller coaster. There are between two thousand and five thousand people arriving daily and there is no end to it, it’s like ground hog day. The world is aware that Greece has its own problems, the economy is in shreds and there is little infrastructure. But despite this people on the island have been remarkable and generous beyond belief, meeting the boats, cooking food, collecting clothing, doing everything they possibly can to make the refugees safe and comfortable. The Greek people have always been welcoming and generous and the foreigners living on the island are doing remarkable work too. Since February men, women, children, old people and disabled people have walked in the rain, wind and searing heat for four days to the islands capital, Mytilene. There they are registered enabling them to board boats to Athens and make their way to new countries where they hope to be safe and build new lives. Some of these people have witnessed members of their families dying. These people are unlikely ever see their homelands again. Can you imagine what that must feel like? It is impossible to ignore the plight of these people, they come in their thousands everyday. Everyone is effected here. It’s extremely traumatic. I saw a man carrying his pet dog under his jacket walking the road towards Mytilene in the rain, this made me break down completely. One image set me off crying, tears streamed down my face and I found myself sobbing uncontrollably. I was beside myself with an unbelievable sense of grief. Later I felt the most enormous amount of guilt. Why did I not stop? Why did I not take him and the dog to the vet to get the dog chipped medicated and a passport for it to travel further? What made this the thing that tipped me over the edge? When I speak with other people they say the same how just one thing can make them cry uncontrollably. Witnessing this daily has been unbelievable, everyone is traumatised. This is the reality. The refugees leave Turkey to travel across the Aegean Sea in overcrowded, rubber and wooden boats some barely seaworthy. They pay traffickers from 1000 to 3000 dollars each to make the journey. The Turkish authorities turn a blind eye to this. If the refugees hesitate because they are terrified the traffickers hold guns to their heads forcing them onto the boats. Some of the rubber boats are being made so fast that the glue has not had time to set. The boats are completely packed, there can be as many as 50 per rubber boat and probably none of the occupants can swim. Sometimes they are told to throw the little possessions they have off the boat. One refugee is given the responsibility of steering the boat, not only can he not see where he is going because the boat is so overcrowded but he has never seen the sea before. Crossing the Aegean can be very dangerous particularly at night. There are many tankers and the sea is rough. Some refugees land with broken and dislocated limbs. Some don’t make it and drown, mostly children and babies. One pregnant womans waters broke in Turkey and was forced onto the boat and gave birth on arrival on the beach at Lesvos. The Greek coastguards do what they can but don’t always have petrol to go out to meet the boats this leaves the local fishermen and volunteers. The fishermen cannot turn a blind eye to sinking boats and rescue people. Unfortunately, their boats are to small to take everyone and they are left to make the decision on who to take and who to leave behind. Why in this day and age when they can send men to the moon is this happening? This is history repeating itself and some of the very old locals remember this trip themselves as children, during the cultural exchange. It’s a nightmare. One of my friends told me that a boat arrived crammed pack with people and there was something different about them that she could not put her finger on, they seemed more traumatised than usual. After they were all taken from the boat she saw the dead body of a woman lying on the bottom. This woman had died before boarding the boat and her family did not want to leave her so her body was put in first and the men women and children placed on top. Last week there were many lives lost in the sea because of storms it is just the saddest thing and there is absolutely no need for this to be happening. Bodies were washed up onto the beaches, a large number being children. These people have been through enough and deserve to be transported safely and treated with dignity. As the winter descends on us the situation will only get worse. I woke up in the middle of the night a few weeks ago feeling sick to my stomach at the thought of the thousands of men, women and children being exposed to terrible storms, pounding rain, wind, thunder and lightening, with no shelter. The island itself cannot cope as there are only few ambulances, rubbish collections are scarce and the coastline is strewn with with fluorescent life jackets and rubber boats. There is litter all along the roads. People are volunteering to help with all this but it does not stop building up with new arrivals. Nothing could have prepared us for any of this. And certainly nothing could have prepared the millions of people who are now called refugees for what they have had to endure to date. As I sit here writing this from the safety of my Sydney home, looking out over the harbour I fail to make sense of any of it. Each day I am haunted by what I have witnessed. I realise that where you are born impacts so much on how your life unfolds. I question world leadership and political motives and my concern grows for the beautiful Island of Lesvos and its generous people. I realise that this situation is so enormous that it will not end any time soon. I understand that people no matter where they come from or what their religion are all the same. I have encountered such warmth and gratitude from those I have transported in my car. Usually we hug to say goodbye and the depth of this hug is huge. It’s important for everyone to see and understand just how fragile the world. It is equally as important to see how wonderful the human race can be when they work together for each other. Thank you to all the Greek people of Lesvos who are sharing everything they have. Thank you to the non Greek locals who have been brilliant working as hard as they possibly can and thank you to the volunteers who have come from all over the world to help. And to the refugees the beautiful people I have met I wish you safety and love and that you find peace and another place you can call home. Please, please don’t let this put you off coming to the island, come and share all the wonderful things that Lesvos and its people have to offer. It is such a special place and it needs not only volunteers but tourists. Yesterday was a superb day here on the island. We seemed to have skipped spring and just gone straight into summer. Just back from Sydney I had woken early and Matthew and I decided to take the dogs along the track towards the sea, a familiar and beautiful walk, especially at this time of year, with the abundance of wild flowers bordering the track. We took off on our walk with three very excited dogs, Hector, Nellie and Tollie. Quite some way down the track probably about 1.5 kilometers we saw a group of people heading towards us. At first we thought it was a walking group but on closer inspection realized it was a large group of refugees. There were about thirty of them, young women and men and two children. They had risked their lives crossing the Aegean Sea over night on a small boat from Turkey. Matthew and I stopped and spoke to them, a couple had some basic English and we learnt they were from Somalia and Syria. These people asked where they were. They had no knowledge they were on an island let alone in Greece. They were beautiful people with nothing more than a few possessions carried in a bag or rut sack. They were tired and thirsty and anxious to find the nearest town where they would present themselves to the police, they were still a long way from that. People often say to us that we are ‘Living the Dream’ and in some ways we are but as Matthew pointed out on seeing these people, they are the ones ‘Living the Dream’. Their dream is escaping their homeland, risking their lives to find a better life without war and persecution. The meeting was a thought provoking experience and I have to admit to a sadness that has hung over me since. We did what we could, loaves of bread, cheese, bottles of water, biscuits and chocolate for the kids but it’s haunted me that it wasn’t enough. Where are they now? Will the find a place to settle and make a new life for themselves, will there be any opportunities? I leave you with one image today an image of the end of the day where the water is still and calm and my thoughts are with the beautiful people.